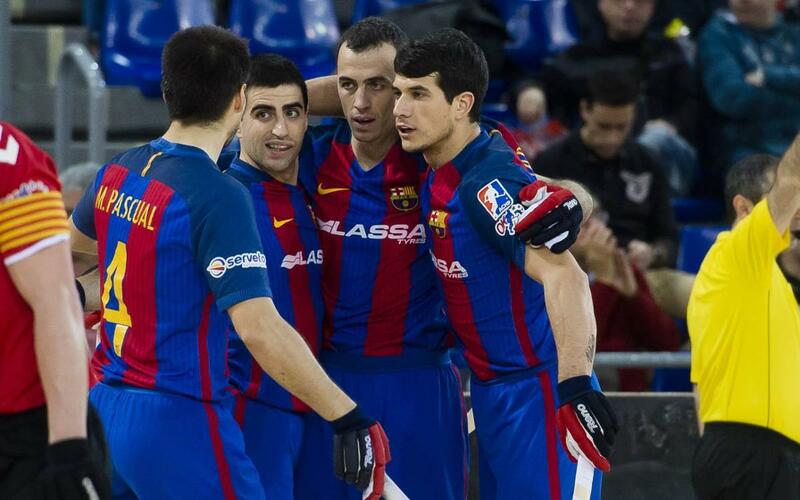 FC Barcelona Lassa roller hockey team started the second half of the OK League season as it finished the end of the first: with a win. The aim was to get another win to keep this month's perfect run going and Ricard Muñoz’s side managed to do so with a 5-0 victory against Moritz Vendrell (5-0). Following this result the blaugranas now have a seven-point lead at the top of the table ahead of Reus and Vic, who drew 3-3 against Lleida. By half time, the score reflected Barça’s dominance with goals from Marc Gual and Ordoñez giving them a well-earned advantage. Further goals from Panadero, Pablo Álvarez and Edu Lamas along with some fantastic Sergi Fernández stops after the break, put some gloss on a fantastic performance and a comprehensive win. Barça started excellently at the Palau and within two minutes found themselves one-nil up courtesy of a Marc Gual goal coming from a powerful shot which left Roger Molina with no chance. Lucas Ordoñez added a penalty in the 14th minute with his twelfth goal in the OK League this season. They could have scored a third from a second penalty but this time the opposition keeper saved well. After the break, Vendrell almost got one back but Sergi Fernández pulled off a remarkable double save from a free kick. Instead of seeing their lead halved, Barça scored two quick fire goals thanks to Panadero and Pablito Álvarez putting them 4-0 up after 29 minutes. The scoreboard didn’t change for a long time even though both sides had chances and this is in large part thanks to Sergi Fernández’s heroics on the home sides behalf. In the end, just before the match concluded a great individual move by Edu Lamas following a Pau Bargalló pass rounded off the evening with the fifth goal in what was a perfect start to the second half of the league campaign.